alaTest has collected and analyzed 264 reviews of Philips Fidelio X2. The average rating for this product is 4.5/5, compared to an average rating of 4.2/5 for other Headphones for all reviews. People really like the sound and bass quality. The comfort and durability also get good feedback. Many are critical about the noise isolation and treble quality. Opinions are divided on the size. We analyzed user and expert ratings, product age and more factors. 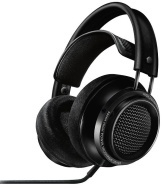 Compared to other Headphones the Philips Fidelio X2 is awarded an overall alaScore™ of 89/100 = Very good quality. Released in early 2013 the Fidelio X1 offered excellent sonic performance with outstanding build quality. Let's find out if the X2 lives up to the name and how it compares to the competition. Bass can get a shade wooley at times like many open headphones. Build, comfort, forward sound, strong and clean bass, just everything! Sound leakage and isolation, large size, not fashion cans. BASS, build quality, overall package. pads a bit stiff, a bit clampy.